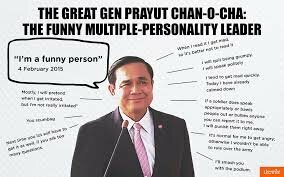 Typical silly media questions, of coarse Khun Prayut won't be drawn into a debate on that. Or anything else. He is like the lofty Manchu rulers of China during the 1830's. Too lofty to talk to the British Admiralty in Canton. Trouble is Steven that he is nowhere near your equal, yet you are happy to drink his Koolaide. The man has the self control of a spoiled child and, therefor, cannot debate. History will not be kind to him or those who supported him. In a coalition style government, he will have to debate or call in the army again. He will disgrace Thailand once again. And why would he? He has issued directives on how this whole process will settle out and now his minions need to execute. Responding to questions could only expose issues he would prefer to silence. Me answer questions, don't you know who I am? Mmmmmm, aren't you the PM candidate for the one of the parties trying to steal the right to govern ? ?